Home » News archive » THE NEW DEAT…st"
THE NEW DEATH CULT: Release Second Single "Zeitgeist"
THE NEW DEATH CULT’s debut single “Light Spills Over” had its world-wide premiere on BBC Dan P. Carter’s Radio Rock Show, Norwegian premiere on one of the biggest rock channels in Norway, Radio Rock, listings on UK's Classic Rock “Track of the Week #3” and over 60k streamings within a month! Today, THE NEW DEATH CULT are back in full-force, with their second single titled “Zeitgeist”! “Zeitgeist is a full-on protest song against the deconstruction of human rights that is currently happening all around us, through warfare, environmental displacement, the proverbial stranglehold of fear-fueled propaganda in mainstream media and how it effects digital surveillance and the increasing monetary and corporate enslavement of the younger generation. To make a change, we have to put our thoughts and words into physical motion, and let our universal love be the force that dismantles the big machine that is surely on it's way to turn us all into dehumanized cookie-cut slaves of its own design. It's very George Orwell's 1984. Musically, the song has a very dark but catchy chorus, while revealing a stupidly cold and mechanical main riff with the lyrics being the focal point. (A definitive side-step from the explosive and exhilarating feel of 'Light Spills Over', but we will weigh that side up again with our next single, so stay tuned, and go make some fuzz in the world!) Disobey fascist ideology, speak up against racism, absolutely rebel against big-scale environmental destruction and reject fear-based propaganda. Love each other! "IF WE DON'T END THE DECONSTRUCTION OF HUMAN RIGHTS NOW THEN THIS GENERATION WILL BE THE LAST TO TRY. "If you agree then Welcome to THE NEW DEATH CULT!" Out on the fringes in the Andromeda galaxy, a new force of light awakens in the dark and endless outer space. The humanoid inhabitants of the distant alien planet of Netuluna have been watching the decaying, war-torn and bleeding planet Earth closely for many years in hope for signs of significant change. They have sadly come to recognize that the eleventh hour now is at hand. In a desperate attempt to unite all humans under the cause of saving their planet and themselves, a new medium is formed. A force more powerful than anything in the universe: HEAVY ROCK MUSIC. Dubbed a brilliant cross-over between QUEENS OF THE STONE AGE, Biffy Clyro and PINK FLOYD, the band drives heavy rock in a forward direction primed for the 21st century, while sonically staying true to the greatest 90’s rock acts. Aesthetically, the band explores a unique melting point where solid ’desert rock’ collide with heavy riffs, ear-tingling melodies and choruses of cosmic grandeur. The lyrics inspire a true universal love and peaceful activism towards an anti-war, anti-environmental destruction and anticorruption movement in music, to make the world a better and safer place for present and future generations. 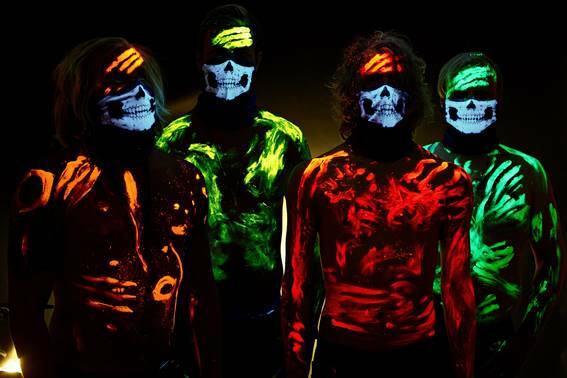 Visually, the band consist of four masked humanoid aliens who go by their pseudonyms ALPHA (vocals + guitar), BETA (lead guitar), GAMMA (bass) and DELTA (drums).